some of you may already know that i have a slight obsession with stationery. recently, i have been loving notebooks, especially ones with blank pages because it offers so much flexibility for creative minds to flourish. i am particularly picky with lined notebooks because i prefer narrow ruled notebooks (it just looks neater and i like small handwriting) compared to the majority of notebooks out on the market that are large lined. i have since then made the move to blank notebooks for my uni books, and i have found that i am no longer restricted by the size of lines in my study, and i can doodle draw diagrams to my heart's content. today i thought i would share the notebooks i am currently obsessing over and i hope you love them as much as i do! i am obsessed with how cute this design is! it's also made out of 100% recycled paper! i couldn't choose my favourite design, so i'm going with the three pack. i absolutely love the stardust design and the phrase 'just start'. it is applicable to so many things in my life right now! jasmine has the prettiest hand lettering as well and i literally want to buy her entire store. i love the marble print of this notebook and combined with the gold foil lettering, it is absolutely gorgeous. i love black and gold in everything. i also love this notebook, from the first page with the gorgeous paint splatter to the 140 pages of glorious unlined pages. oh my goodness when kikki.k launched their new be brave collection, i made sure to visit their store. the colours in this collection are so pretty!!!!! before i started getting into black, my favourite colour was sky/baby blue so i am obsessed! i need everything in this collection. also i've been experimenting with creating my own font the past few days! the font in the image above is my own yay! it's still for private use and still needs to be perfected, but i can see this becoming another obsession in the near future. i'm excited!!!!! 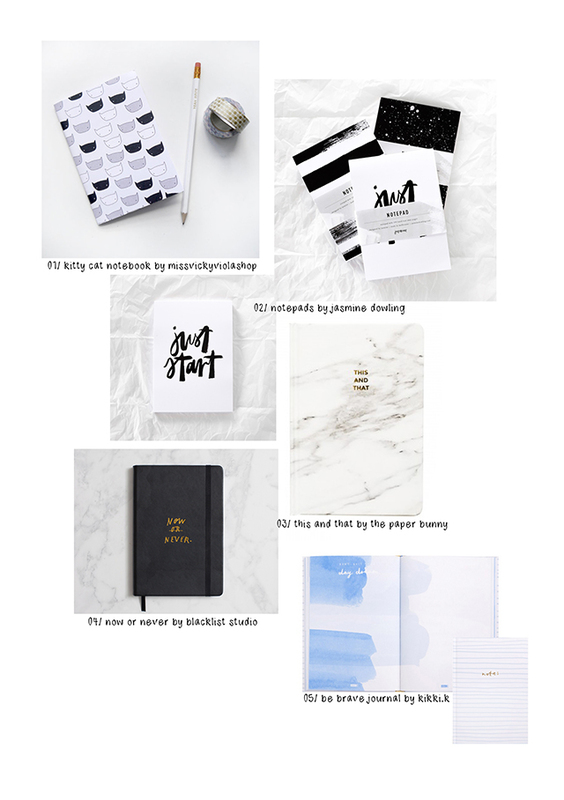 6 comments on "WISHLIST: NOTEBOOK EDITION"
Gosh, what gorgeous notebooks! Since becoming a student again this year, I've become obsessed with ogling pretty stationary, and these are some stunning picks! I love notebooks, I have so many! I'm loving the "Just start" one. Love, love, love your picks! Especially the "Just Start" one - so rad. I've reignited my love for stationery since starting an office job - it's so nice to be able to write in cool notebooks and have them looking pretty snazzy on your desk!